A visit to Bhoominathar Swami Temple situated in Mannachanallur in Tiruchy, Tamil Nadu, would leave one wondering about the mount of soil near the vilva maram (bilva tree) inside. TIRUCHY: A visit to Bhoominathar Swami Temple situated in Mannachanallur in Tiruchy, Tamil Nadu, would leave one wondering about the mount of soil near the vilva maram (bilva tree) inside. Devotees facing property disputes carry a handful of soil from their land, tied in a yellow cloth, and walk into the temple to deposit it near the bilva tree, praying for smooth resolution of issues. At a time when people take property related issues through the legal process, there are some who take it to the Almighty. The belief of the devotees extends to a vanni maram (shami tree) as well with another handful of soil deposited at its base. The temple sees devotees from all quarters, but mainly from Pollachi, Karur, Erode, Tharapuram and Coimbatore. 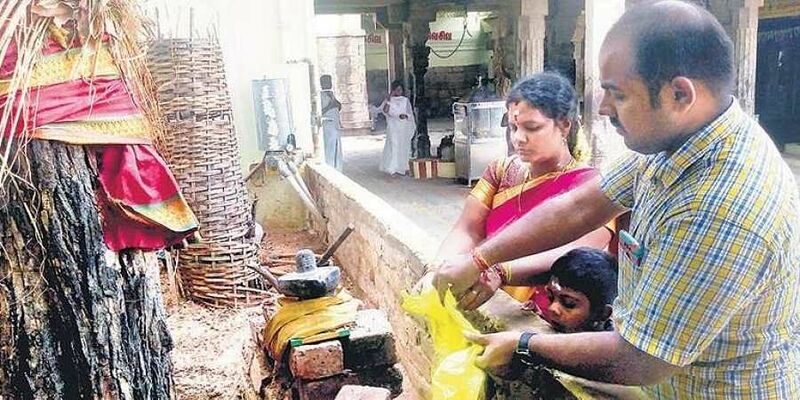 According to officials at the temple, there are devotees who come from Bengaluru to visit the temple in case they experience any difficulties in selling, buying land or building houses. “A devotee facing property disputes brings a handful of soil from their land, which could probably be taken in the north-east direction. The handful of soil has to be tied into a yellow cloth that should be deposited here. After taking blessings from Lord Shiva, the person has to go around the sanctum three times,” said R Giritharan, chief priest of the temple. He added that the devotee has to drop the soil near bilva tree after circumambulating the sanctum.